In yet another major blow and jolt to the Indigenous People's Front of Tripura (IPFT), the first choice candidate of this tribal based regional poltical party which is currently in coalition with BJP in government of this state, Sukla Charan Noatia tonight joined the Congress party. Congress president Pradyot Kishore Deb Burman welcomes Sukla and his group at his palace at Agartala. Earlier the Vice President of IPFT Ananta Debbarma has joined the congress which perhaps has been comming up just in wake of the ensuing Lok Sabha Poll. 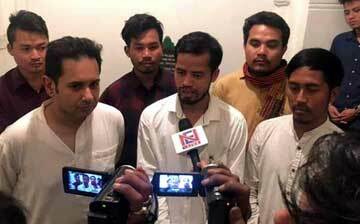 Sukla Charan Noatia the youth IPFT leader who has been contantly supporting the IPFT' 'Twipra Land' demand and filed his nomination paper for the West Tripura Constituency as the first choice of N C Debbarma's IPFT, though later cancelled today after joining the congress said, "This BJP-IPFT coalition government has failed to meet the demand of Tribals of this state which has been slogging for separate state. "For the past one year in government the BJP-IPFT coalition has neglected the tribals in ADC," adding Sukla known to be close aid of Pradyot said, "I quit the IPFT today because we the tribals are against the Citizenship Amendment Bill-2016." He said, "I joined congress as it shall pave a ray of hope for the trobals in the ADCs in Tripura." As the IPFT has chosen to battle separately this LS Poll despite being an alliance partner with the BJP in power in this state, it nominated Sukla as its first candidate to contest from West Tripura Constituency. Sukla's nomination was however been rejected later.